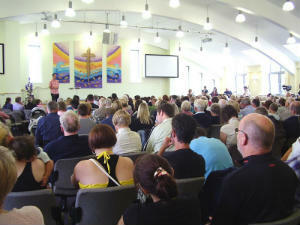 Queens Road Baptist Church is a community of friends who love the chance to welcome and make new friends. At the centre of our community life is the desire to learn and experience what it means to follow the ways of Jesus. We want to invite others to come and explore the Christian faith through our community life which is expressed through a whole range of different activities and groups. Hopefully everyone can find a place to belong. As followers of Jesus we believe that everyone has been made unique and is equally loved by God. We try to demonstrate this through the Gap Project, our commitment to projects overseas, and our work for greater justice in the world. You can discover more about our community life through this web-site but most of all we would love to meet you and have the chance to get to know you. Take a look at our weekly diary which will show you various opportunities where that can happen.